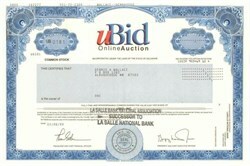 Beautifully engraved certificate from the uBid Online Auction issued in 1999. This historic document was printed by the United States Banknote Corporation and has an ornate border around it. This item has the printed signatures of the Company's President and Chief Executive Officer, and Treasurer and Cheif Financial Officer. This is the first time we have had this certificate and it is #181.
uBid was founded in April 1997 as a division of Creative Computers, a U.S. catalog retailer, to help the company move its excess and refurbished computing inventory online. In December 1998, uBid became listed on the NASDAQ National Market through an initial public offering. Since its inception, the company has experienced exceptional growth, generating revenue of $48.2 million in its first full year of operations and revenue of $204.9 million for the year ending December 1999. In April 2000, uBid officially joined the CMGI network as a majority-owned operating company and has since entered into agreements with several CMGI network companies to create powerful alliances. uBid re-launched its site in June 2001, integrating its three auction channels to enable three easy buying and selling solutions. In addition, the company opened a new 400,000 square foot warehouse to offer a wider array of products as well as a refurbishment center, providing a fully integrated logistics solution for handling the return, repair, refurbishment and re-marketing of technology products.